Okay, y’all. I hope you’re sitting because I have a horror story for you. The other night, I was home alone while S was finishing up his late shift. It was about 10:45pm. I decided to go ahead and take my shower. So I get in the shower and the water is warm and lovely, and my shampoo still smells good, and I go about my little shower routine. We have a tall shower head. It’s fantastic since I am almost 6′ tall and I hate doing back-bends just to rinse my hair. This shower head is attached to the wall of course, but it also had a detachable hose part that clips into the center of the regular shower head. We usually leave that part clipped in, but there’s a long hose that drapes down to the faucet handles where you adjust the water temperature, and then back up to the head. Just as I get my hair all lathered up and soapy, A HORRIBLE GIANT SPIDER COMES CREEPING FROM THE SHOWER HEAD, DOWN THE HOSE. I freeze, breathing hard. WHAT DO I DO? 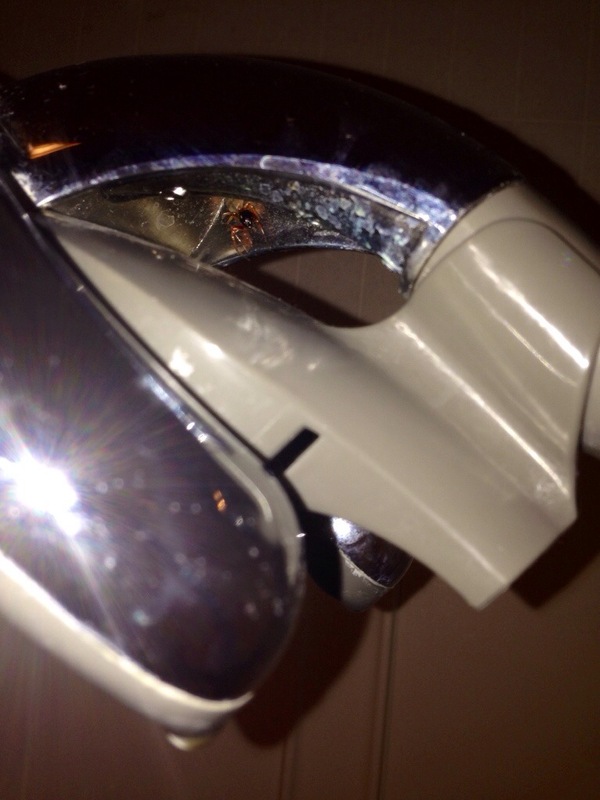 The spider stops halfway down, turns around, and CRAWLS BACK UP THE HOSE AND DISAPPEARS ON THE SHOWER HEAD. I wait, hands still in soapy hair. Nothing. I can’t see it. I start thinking of all my options. I can’t get under the shower head, because I’m terrified it will fall on me. My hair is completely soaped up. I could wait for S to get home. Except it will be at least 30 minutes and that’s a long time to stand scared and soapy in a shower. If I could just SEE it…. I pull the shower curtain back, step carefully onto the tile floor, and peer up at the shower head. Nothing. Still can’t see it. I get back into the shower stall and pull the curtain back into place. Staring at it, I realize that part of the shower head pops off. I carefully remove it, inspecting every inch for spiders. As there were none, I was able to rinse my hair. I dropped the hose and left it dangling, turned off the water, and cut my shower short. After I had dried off, I went back, using my phone as a flashlight. I FOUND THE NASTY LITTLE SUCKER. And I swear – he’s MUCH MUCH bigger when his legs aren’t folded up and he’s creeping down the shower hose at you.